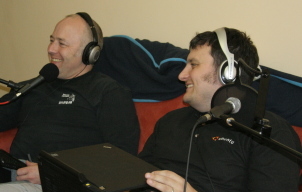 Ciemon Dunville, Alan Pope, Dave Walker and Tony Whitmore present the third episode of the Ubuntu UK Podcast. Adobe releases Air for Linux. UK Conservative & Labour Parties talk about Open Source. Ubuntu survives Tipping point “Pwn to Own” contest. I am enjoying your podcast. Would you consider changing the name of your feed to remove unicode characters so that juice podcatcher on windows doesn’t choke on it? Hi, this is the first one I’ve listened to. Firstly, well done. Keep the music! I did think that the `whitespace’ after the music, or inbetween some of the speakers, was too small. The “hello, my name’s …” bit at the beginning is a good example. Also, given you each have a specific stereo position, can you say you’re introducing yourself “left to right” and have the photo match that order. And have the same names on the photos as you use when speaking. Thanks again. Ralph.